Since I last saw Kym a year previously, things had taken off a bit. 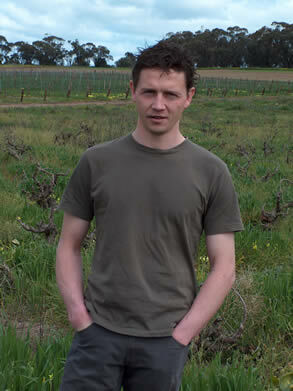 He’s still managing Rolf Binder’s winery (formerly known as Veritas – the name had to be changed because of legal reasons) very ably, but production of Kym’s own wines has stepped up a good deal, to the extent that he’s now crushing 75 tons this vintage. It’s a good job that Rolf has a big facility with plenty of spare space. When I arrived he was half way through trying to restart a stuck ferment, but a power cut prevented any more pumping, so instead we fished around for barrel samples in the fading twighlight. Kym’s pretty athletic and can reach the top of a five-high barrel stack without the need for a ladder. It makes for nervous viewing though. 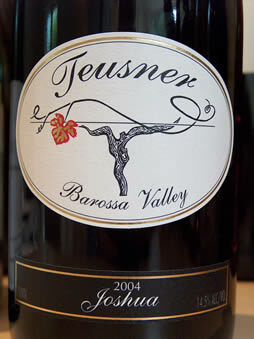 A new addition to the Teusner range is the charming Riebke Shiraz. One of the growers he worked with came to him with a load of Shiraz fruit that was surplus to requirements with a big company. Kym had a look and decided that it was excellent quality, hence this wine: 1200 cases of to quality, affordable Shiraz from the Ebenezer district of the Barossa. The following notes are all from bottled wines.